Aerial view of Spirit Lake (center) looking north from above the crater of Mount St. Helens. The lake’s outlet to the west (left) was blocked by the 1980 landslide, which required a new engineered outlet to maintain the lake at a safe level. A tunnel was drilled through a bedrock ridge on west side of lake in 1984-1985. Glacier covered Mount Rainier in distance. USGS photo by M. Logan, 2005. Thirty-seven years after the May 18, 1980, eruption of Mount St. Helens, Washington, scientists, engineers, land managers, and Federal, State, and County officials are still grappling with a challenge created by the eruption—how to prevent potentially massive downstream flooding by the release of water from Spirit Lake, located at the base of the volcano. A new report published this summer by the U.S. Forest Service (USFS) describes the complex and interrelated natural hazards—volcanic, seismic, and hydrologic—and risks associated with several options to manage the water level of Spirit Lake (www.fs.usda.gov/treesearch/pub…). 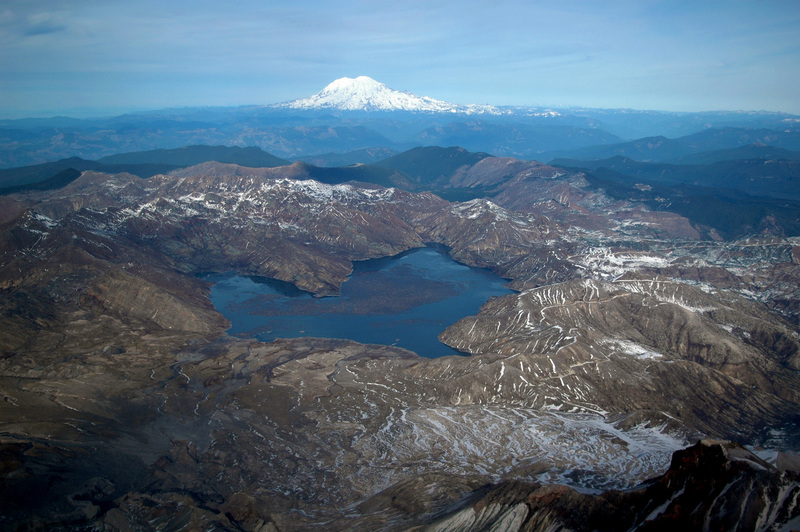 The USFS is the agency charged with management of the Mount St. Helens National Volcanic Monument, including an engineered outlet for Spirit Lake. The 1980 eruption began with an enormous landslide, released as a series of massive blocks of rock and ice from the volcano. Most of the sliding debris sped 22 km (13.7 mi) down the North Fort Toutle River, filling the valley to an average of depth of about 45 m (148 ft) in about ten minutes. Part of the landslide slammed into Spirit Lake, blocking its natural outlet and raising the lake level by 60 m (197 ft). In the area between Spirit Lake and the North Fork Toutle River to the west, the landslide deposit is as thick as 195 m (640 ft)! Without an outlet, the lake rose with each rainstorm and seasonal snowmelt. By August 1982, the lake level had risen another 16.5 m (54 ft). At that filling rate, water was projected to possibly breach the blockage and produce a catastrophic flood by 1985. Such a flood would likely lead to loss of life and extensive damage (more than $1 billion) in communities downstream along the Toutle, Cowlitz, and Columbia rivers. To mitigate this potential flood hazard, President Reagan, on August 19, 1982, directed the Federal Emergency Management Agency (FEMA) to develop a strategy to prevent breaching of the landslide blockage. While various outlet alternatives were proposed and studied, a temporary pumping facility was installed to lower and stabilize the lake level. Ultimately, the U.S. Army Corps of Engineers constructed a 2.6-km (8,500 ft) long, 3.4-m (11 ft) diameter tunnel through a bedrock ridge on the west side of Spirit Lake to deliver its water back into the North Fork Toutle River. The tunnel has successfully controlled the lake level since 1985. However, several major and costly repairs to the tunnel, owing to damage caused by surrounding rock squeezing it, were necessary in 1995, 1996, and 2016. Additional repairs are expected in the future. When sections of the tunnel are repaired or upgraded, the tunnel is closed for many months. Repairs always happen during the winter rainy season to ensure adequate streamflow downstream for fish. With the tunnel closed, the lake level rises, and during each repair water has approached its maximum “safe” level. Such high water levels raise concern. If the lake rises only a few meters (yards) higher than it has during prior repairs, for example during an exceptional weather event coincident with an extended tunnel closure, the consequences could be “severe” according the USFS report. To address this concern, an interagency task force evaluated risks associated with the current tunnel and alternative outlets. The new report summarizes those potential risks, including those to an engineered open channel just below the volcano’s north-facing crater, an option exposed to volcanic events that could block or damage the channel, and a buried pipe through the chaotic landslide deposit. As yet, the USFS has not made any decisions regarding a new outlet strategy. The new reports will help inform such decisions given the volcanic, seismic, and hydrologic hazards that threaten each alternative as well as the long-term costs.